What happens when you combine the utility of a truck, versatility of an SUV and amenities you'd expect in a luxury car? You get the ever-capable Suburban. With a best-in-class V8 fuel economy of 23 MPG highway, this large SUV gets you where you want to go and is built to accommodate your family's needs. 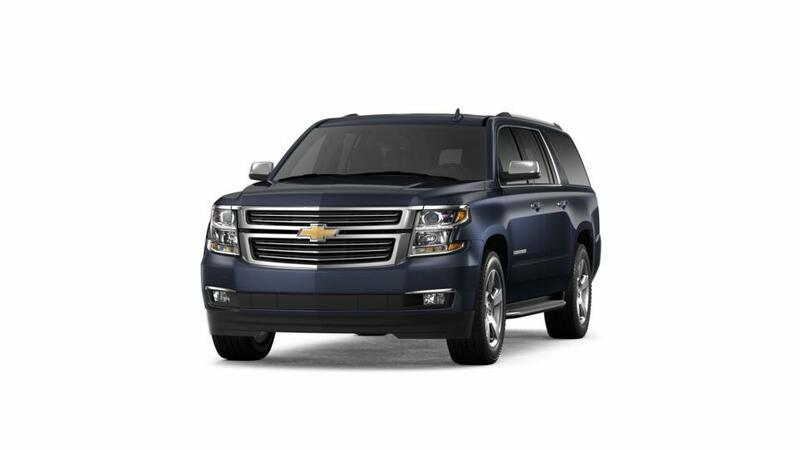 It's no wonder Suburban is part of America's best-selling family of full-size SUVs. 1Not available with special financing, lease and some other offers. See dealer for details. 2Conquest % Cash Back. Stackable % Cash Back for customers who have owned or leased a 2005 or newer Non-GM Vehicle for a minimum of 30 days. Allowance Available on Retail Program info. Compatible with % Off and % Conquest Private Offer ONLY. All Programs Effective Until 4/30/2019 Unless Otherwise Indicated. 3Must qualify through GM Financial. Not available with special finance, lease, or some other offers. Take delivery by 04-30-2019. See dealer for details. 4Not available with special financing, lease and some other offers. See dealer for details. 5The dealer in this advertisement & their marketing firm are not responsible for errors or misprints. Prior Sales Excluded. All incentives to dealer. Vehicle photos intended for illustrative purposes only. *Maximum cash savings on select in-stock units only while inventory supplies last. $9,033.00 cash savings in lieu of any special finance rates and cannot be combined with leases,special APR or any additional coupons or offers including GM Discount Programs. $9,033 maximum savings specific to stock #N133587, 4WD Premier with MSRP $77,580.00. Your total savings and "buy for" price will vary based on availability and the vehicle you choose. $9,033.00 is the total and maximum savings after all rebates, coupons and dealer discounts. Savings include GM Supplier Pricing plus rebates, including GMF Down Payment Assistance; must finance through GM Financial at standard rate (lender approval required) and Chevy Conquest Cash rebate; must prove current ownership or lease of qualifying 2005 or newer non-GM vehicle. Advertised pricing does not include tax, title, DMV, or $79 Dealer DOC Fee. Offer applies to retail purchase only when financed through GM Financial. See dealer for complete details. All offers expire 4/30/2019. 1Conquest % Cash Back. Stackable % Cash Back for customers who have owned or leased a 2005 or newer Non-GM Vehicle for a minimum of 30 days. Allowance Available on Retail Program info. Compatible with % Off and % Conquest Private Offer ONLY. All Programs Effective Until 4/30/2019 Unless Otherwise Indicated. 2The dealer in this advertisement & their marketing firm are not responsible for errors or misprints. Prior Sales Excluded. All incentives to dealer. Vehicle photos intended for illustrative purposes only. *Maximum cash savings on select in-stock units only while inventory supplies last. $9,033.00 cash savings in lieu of any special finance rates and cannot be combined with leases,special APR or any additional coupons or offers including GM Discount Programs. $9,033 maximum savings specific to stock #N133587, 4WD Premier with MSRP $77,580.00. Your total savings and "buy for" price will vary based on availability and the vehicle you choose. $9,033.00 is the total and maximum savings after all rebates, coupons and dealer discounts. Savings include GM Supplier Pricing plus rebates, including GMF Down Payment Assistance; must finance through GM Financial at standard rate (lender approval required) and Chevy Conquest Cash rebate; must prove current ownership or lease of qualifying 2005 or newer non-GM vehicle. Advertised pricing does not include tax, title, DMV, or $79 Dealer DOC Fee. Offer applies to retail purchase only when financed through GM Financial. See dealer for complete details. All offers expire 4/30/2019. Have you ever wondered what it's like to have it all? The all-new Equinox was designed with your needs and wants in mind. From style and technology to performance and safety, this versatile crossover offers the complete package. 1Excludes L model. Not available with special financing, lease and some other offers. See participating dealer for details. 2Conquest % Cash Back. Stackable % Cash Back for customers who have owned or leased a 2005 or newer Non-GM Vehicle for a minimum of 30 days. Allowance Available on Retail Program info. Compatible with % Off and % Conquest Private Offer ONLY. All Programs Effective Until 4/30/2019 Unless Otherwise Indicated. 3Excludes L model. Not available with special financing, lease and some other offers. See participating dealer for details. 4Must qualify through GM Financial. Not available with special finance, lease, or some other offers. Take delivery by 04-30-2019. See dealer for details. 5The dealer in this advertisement & their marketing firm are not responsible for errors or misprints. Prior Sales Excluded. All incentives to dealer. Vehicle photos intended for illustrative purposes only. *Maximum cash savings on in-stock units only while inventory supplies last. Cash savings in lieu of any special finance rates and cannot be combined with leases,special APR or any additional coupons or offers including GM Discount Programs. Cash savings on select 2019 Equinox models; $8,531 maximum savings specific to stock #N126696, AWD Premier with MSRP $42,650.00. $8,531 is the total and maximum savings after all rebates, coupons and dealer discounts. Savings include GM Supplier Pricing plus rebates, including Chevy Conquest Rebate (must prove current ownership / lease of a qualifying 2005 or newer non-GM vehicle) and GMF Down Payment Assistance; must finance through GM Financial at standard rate (lender approval required.) Your total savings and "buy for" price will vary based on availability, the vehicle you choose and the rebates you qualify for. + 0% Financing for 72 months for well qualified buyers; lender approval required. Some models excluded. Payment = $13.89 per $1,000 financed. Advertised pricing does not include tax, title, DMV, or $79 Dealer DOC Fee. Offer applies to qualified retail purchase only when financed through GM Financial. See dealer for complete details. All offers expire 4/30/2019. 1Conquest % Cash Back. Stackable % Cash Back for customers who have owned or leased a 2005 or newer Non-GM Vehicle for a minimum of 30 days. Allowance Available on Retail Program info. Compatible with % Off and % Conquest Private Offer ONLY. All Programs Effective Until 4/30/2019 Unless Otherwise Indicated. 2The dealer in this advertisement & their marketing firm are not responsible for errors or misprints. Prior Sales Excluded. All incentives to dealer. Vehicle photos intended for illustrative purposes only. *Maximum cash savings on in-stock units only while inventory supplies last. Cash savings in lieu of any special finance rates and cannot be combined with leases,special APR or any additional coupons or offers including GM Discount Programs. Cash savings on select 2019 Equinox models; $8,531 maximum savings specific to stock #N126696, AWD Premier with MSRP $42,650.00. $8,531 is the total and maximum savings after all rebates, coupons and dealer discounts. Savings include GM Supplier Pricing plus rebates, including Chevy Conquest Rebate (must prove current ownership / lease of a qualifying 2005 or newer non-GM vehicle) and GMF Down Payment Assistance; must finance through GM Financial at standard rate (lender approval required.) Your total savings and "buy for" price will vary based on availability, the vehicle you choose and the rebates you qualify for. + 0% Financing for 72 months for well qualified buyers; lender approval required. Some models excluded. Payment = $13.89 per $1,000 financed. Advertised pricing does not include tax, title, DMV, or $79 Dealer DOC Fee. Offer applies to qualified retail purchase only when financed through GM Financial. See dealer for complete details. All offers expire 4/30/2019. 3Must finance through GM Financial. Not available with leases and some other offers. Take delivery by 04-30-2019. See dealer for details. 1Conquest % Cash Back. Stackable % Cash Back for customers who have owned or leased a 2005 or newer Non-GM Vehicle for a minimum of 30 days. Allowance Available on Retail Program info. Compatible with % Off and % Conquest Private Offer ONLY. All Programs Effective Until 4/30/2019 Unless Otherwise Indicated. 2The dealer in this advertisement & their marketing firm are not responsible for errors or misprints. Prior Sales Excluded. All incentives to dealer. Vehicle photos intended for illustrative purposes only. *Maximum cash savings on in-stock units only while inventory supplies last. Cash savings in lieu of any special finance rates and cannot be combined with leases,special APR or any additional coupons or offers including GM Discount Programs. Cash savings on select 2019 Equinox models; $8,531 maximum savings specific to stock #N126696, AWD Premier with MSRP $42,650.00. $8,531 is the total and maximum savings after all rebates, coupons and dealer discounts. Savings include GM Supplier Pricing plus rebates, including Chevy Conquest Rebate (must prove current ownership / lease of a qualifying 2005 or newer non-GM vehicle) and GMF Down Payment Assistance; must finance through GM Financial at standard rate (lender approval required.) Your total savings and "buy for" price will vary based on availability, the vehicle you choose and the rebates you qualify for. + 0% Financing for 72 months for well qualified buyers; lender approval required. Some models excluded. Payment = $13.89 per $1,000 financed. Advertised pricing does not include tax, title, DMV, or $79 Dealer DOC Fee. Offer applies to qualified retail purchase only when financed through GM Financial. See dealer for complete details. All offers expire 4/30/2019. With its superb blend of advanced technology, bold styling and powerful performance, it's no wonder Tahoe has been America's best-selling full-size SUV year after year - or that Tahoe was named the "Most Dependable Large SUV." 1Not available with special financing, lease and some other offers. See dealer for details. 2Conquest % Cash Back. Stackable % Cash Back for customers who have owned or leased a 2005 or newer Non-GM Vehicle for a minimum of 30 days. Allowance Available on Retail Program info. Compatible with % Off and % Conquest Private Offer ONLY. All Programs Effective Until 4/30/2019 Unless Otherwise Indicated. 3Must qualify through GM Financial. Not available with special finance, lease, or some other offers. Take delivery by 04-30-2019. See dealer for details. 4Not available with special financing, lease and some other offers. See dealer for details. 5The dealer in this advertisement & their marketing firm are not responsible for errors or misprints. Prior Sales Excluded. All incentives to dealer. Vehicle photos intended for illustrative purposes only. *Maximum cash savings on in-stock units only while inventory supplies last. $8,337.00 cash savings in lieu of any special finance rates and cannot be combined with leases,special APR or any additional coupons or offers including GM Discount Programs. $8,337 maximum savings specific to stock #N305460, 4WD Premier with MSRP $76,330.00. Your total savings and "buy for" price will vary based on availability and the vehicle you choose. $8,337.00 is the total and maximum savings after all rebates, coupons and dealer discounts. Savings include GM Supplier Pricing plus rebates, including GMF Down Payment Assistance; must finance through GM Financial at standard rate (lender approval required) and Chevy Conquest Cash Rebate - must prove ownership or lease a qualifying 2005 or newer non-GM vehicle. Advertised pricing does not include tax, title, DMV, or $79 Dealer DOC Fee. Offer applies to qualified retail purchase only when financed through GM Financial. See dealer for complete details. All offers expire 4/30/2019. 1Conquest % Cash Back. Stackable % Cash Back for customers who have owned or leased a 2005 or newer Non-GM Vehicle for a minimum of 30 days. Allowance Available on Retail Program info. Compatible with % Off and % Conquest Private Offer ONLY. All Programs Effective Until 4/30/2019 Unless Otherwise Indicated. 2The dealer in this advertisement & their marketing firm are not responsible for errors or misprints. Prior Sales Excluded. All incentives to dealer. Vehicle photos intended for illustrative purposes only. *Maximum cash savings on in-stock units only while inventory supplies last. $8,337.00 cash savings in lieu of any special finance rates and cannot be combined with leases,special APR or any additional coupons or offers including GM Discount Programs. $8,337 maximum savings specific to stock #N305460, 4WD Premier with MSRP $76,330.00. Your total savings and "buy for" price will vary based on availability and the vehicle you choose. $8,337.00 is the total and maximum savings after all rebates, coupons and dealer discounts. Savings include GM Supplier Pricing plus rebates, including GMF Down Payment Assistance; must finance through GM Financial at standard rate (lender approval required) and Chevy Conquest Cash Rebate - must prove ownership or lease a qualifying 2005 or newer non-GM vehicle. Advertised pricing does not include tax, title, DMV, or $79 Dealer DOC Fee. Offer applies to qualified retail purchase only when financed through GM Financial. See dealer for complete details. All offers expire 4/30/2019. 1Excludes L model. Not available with special financing, lease and some other offers. See participating dealer for details. 2Conquest % Cash Back. Stackable % Cash Back for customers who have owned or leased a 2005 or newer Non-GM Vehicle for a minimum of 30 days. Allowance Available on Retail Program info. Compatible with % Off and % Conquest Private Offer ONLY. All Programs Effective Until 4/30/2019 Unless Otherwise Indicated. 3Excludes L model. Not available with special financing, lease and some other offers. See participating dealer for details. 4Must qualify through GM Financial. Not available with special finance, lease, or some other offers. Take delivery by 04-30-2019. See dealer for details.